Here you can find information on all of my current and past releases! 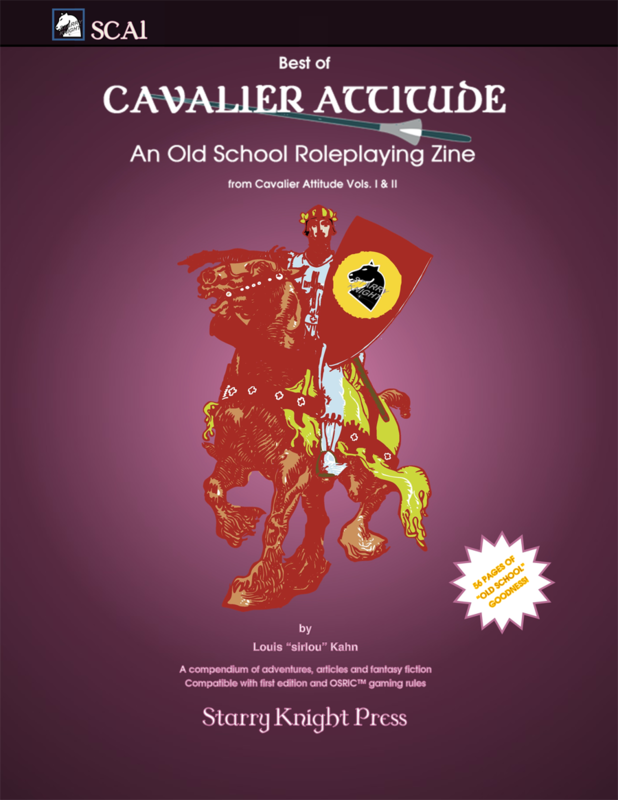 March 2019: I am very happy to announce the release of my thirty-sixth supplement and the seventh issue of my Old School zine: Cavalier Attitude, Vol. 3, Issue 1. It is available for purchase right now in PDF format! Felony Murder Hobos: Law and Order in Medieval Campaigns: an article on applying legal system in your fantasy role playing campaign. Bard’s Corner: a feature showcasing fantasy fiction with an RPG theme, by myself and others. The story in this issue is entitled “Prue’s Fate". Magickal Menagerie: a feature wherein we provide new and unique magic items for your players, straight from the pages of my published adventures! Pre-generated player character: a set of six pre-generated player character ready to take on whatever your GM’s campaign can dish out. 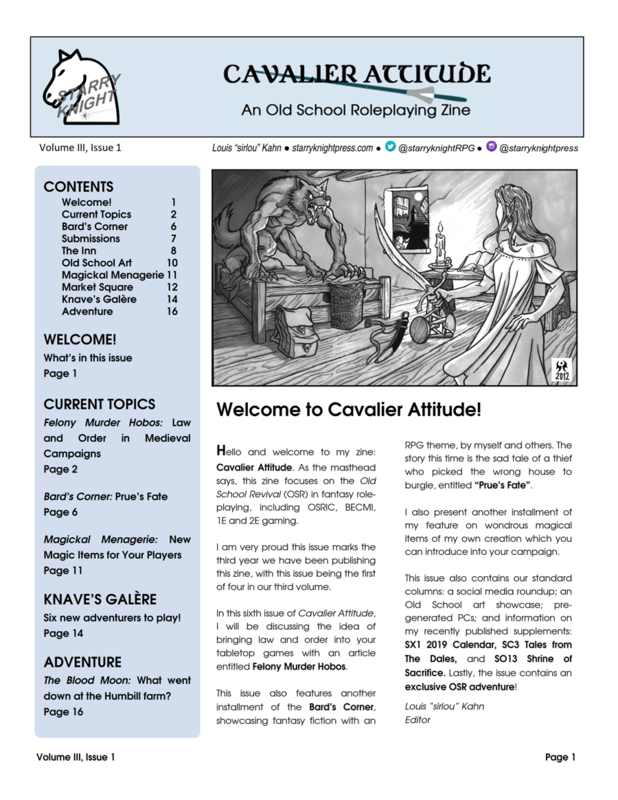 This issue features our new landscape character sheet format, which we hope you enjoy! An Exclusive OSR adventure, "The Blood Moon": a lycanthrope-themed OSR adventure which takes place at a ransacked farm a few short miles outside civilization, known as the Humbill House. This mid-level adventure features a set of three new lycans, the WEREWEASEL, WEREJACKAL and WERELION. It is compatible with most FRPGs and is intended for 4-6 player characters of levels 4-6. BONUS HANDOUT: A full-page sized handout of the map for the Humbill House farmstead for use with the BLOOD MOON adventure. February 2019: My first stand alone one-shot of 2019 is a scary tale full of undead and demonic foes! I'm happy to announce the release of my thirty-fifth OSR book, SO13 SHRINE OF SACRIFICE! It is available now as a PDF. 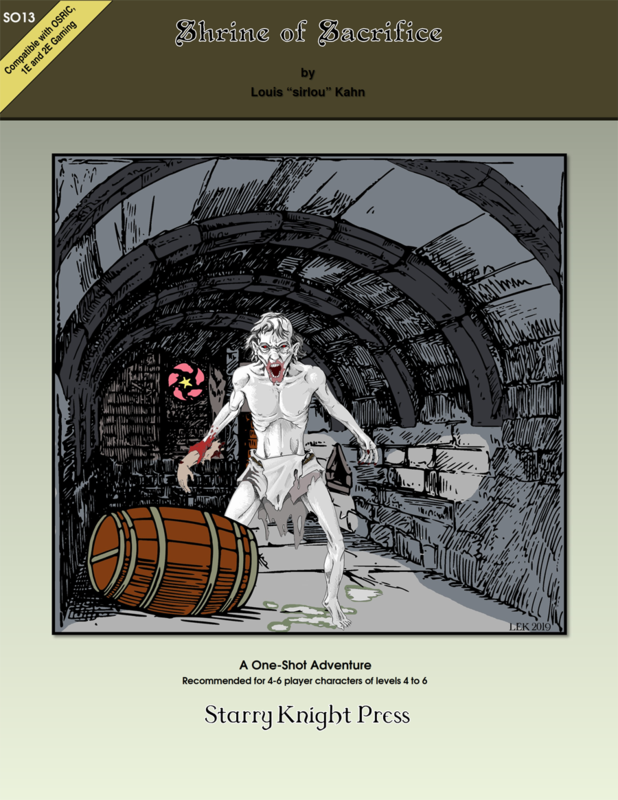 This book is a undead themed one-shot adventure intended for a group of 4-6 players of levels 4th to 6th level. It is my thirteenth one-shot adventure and the fifth to take place in the Red Eagle Barony. It is, however, the first to provide information on the vast woods of the Dlutha Forest, located in the Red Eagle Barony. Long ago, dark elves attacked and attempted to overrun the shrine, with the aid of a succubus. The evil forces’ tunneled up into the oldest part of the shrine complex and a hard fought battle ensued between the two elven forces. The elves of light won the day when the shrine’s caretaker, calling on Corcul’lain’s power, trapped the demon and then sacrificed herself by calling an earthquake that destroyed the dark elves and their tunnel, thereby ending the invasion. With the demon trapped and the invaders dead, the site was sealed and wards and watchers placed over it. Over time, some of the corpses of the dead invaders have become undead due to the polluting negative plane energy flowing from the trapped demon. January 2019: I am really pleased to announce the release of my thirty-fourth supplement and my third book in the "SC-series" of adventure compilations. 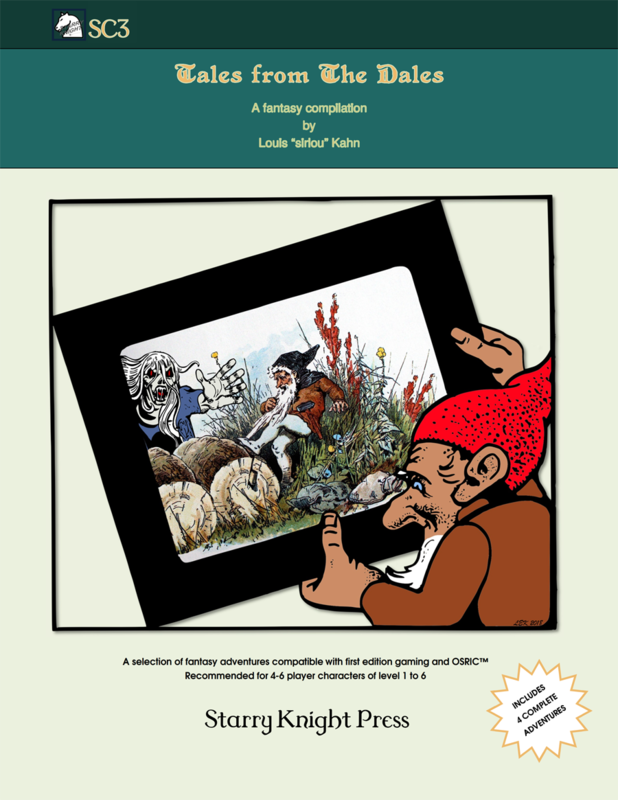 This one is entitled "Tales from The Dales", and this compilation is a bit different from my other two as all four adventures take place in the newly revealed nation of The Dales, the ancestral home of dwarves, gnomes and halflings in my campaign realm! This massive tome contains four complete adventures for 4-6 players of Levels 1-6. This 76 page compilation module contains all the information you need for running your players through many sessions of epic dungeon crawling fun! The supplement provides GMs and players with all the DUNGEON AND OVERLAND MAPS they need, it provides you with PRE-GENERATED CHARACTERS, appendices for NEW MONSTERS, NEW SPELL and NEW MAGIC ITEMS, PLAYER HAND-OUTS...and so much more! 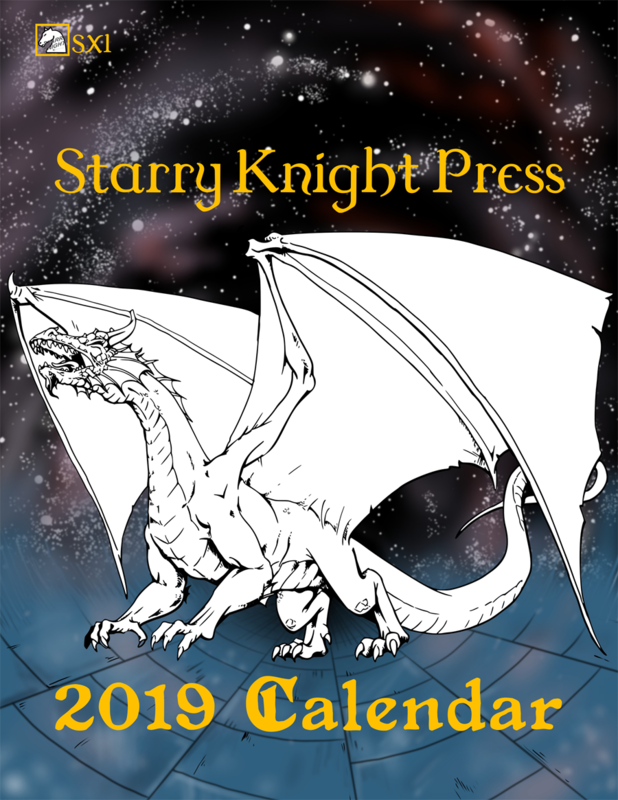 January 2019: I am very happy to announce a first for Starry Knight Press, our thirty-third release is our first yearly calendar! It is currently available for purchase now in PDF format! This 12 Month calendar features a different Starry Knight Press supplement each month, coinciding with the month the supplement was written and/or released. The calendar also contains the United States Federal Holidays, as well as the major religious holidays for several faiths including the Old Faith, which is a key religion the faiths in my published campaign are based on. It also includes the birthdays of authors, creators and artists who are important and influential to me and many others in the RPG and fantasy community (e.g. Gary Gygax, J.R.R. Tolkien, J.K. Rowling, and etc.). This calendar is being released as a Pay What Your Want product, and everyone is encouraged to download it and enjoy it! I would kindly ask you to please leave the suggested contribution ($1) if you like my content and you are interested in supporting me and helping to keep the lights on here at Starry Knight Press!